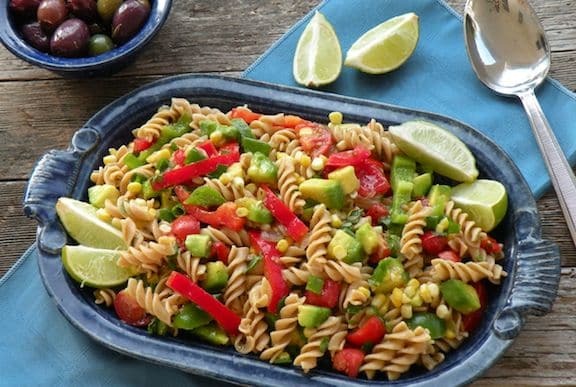 This pasta salad featuring peppers, avocado, and corn has a delectable southwestern flavor. 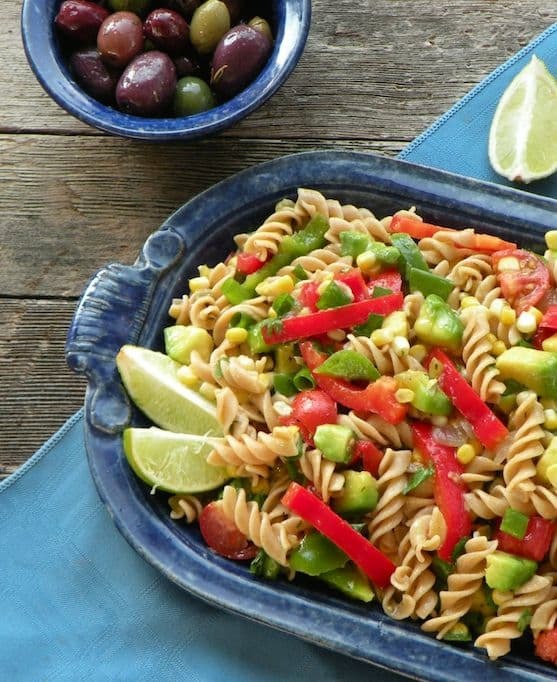 For a nice warm-weather meal, serve with a simple bean dish or vegan quesadillas. Photos by Rachael Braun. Cook the pasta in plenty of simmering water until al dente. Once it’s just about done, add the corn kernels and cook for just another minute or so. Drain and rinse under cool water, then drain well again. Meanwhile, place the avocado in a large serving container. Toss with the lime juice. Add the cooked pasta and corn and all the remaining ingredients. Toss gently and thoroughly, and serve. Variation: For a heartier salad, add 1 1/2 to 2 cups cooked or canned pinto or kidney beans. In that case, of course, don’t serve with a bean dish. But do consider vegan quesadillas, as they’d be a perfect companion!